John Rutledge was one of the Founding Fathers, but is not very well known. His claim to history? Helping to write the South Carolina Constitution. Most of the language he used in that document ended up in the US Constitution!! You can choose to have your breakfast served in the large beautiful room that was once his study. A lot to think about as you are enjoying your morning eggs! A very nice afternoon tea is also served here. The rooms are lovely, beautifully decorated with antique reproductions. There is a full time concierge, but if he is busy the entire staff is very friendly and helpful about restaurant recommendations, directions etc. It was still March when we were there but there is a beautiful courtyard where you can also have breakfast. Thank you for the kind review of your stay at the John Rutledge House Inn. 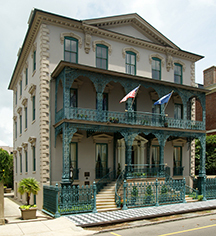 We love being able to offer a unique place to stay in Charleston that is rich in history. We are delighted to read that you enjoyed our beautifully decorate rooms and courtyard. We appreciate your compliments to our staff and the daily complimentary breakfast. We hope to have you stay with us again in the future. My husband and I just returned from a 3 night stay. The Bed & Breakfast is beautiful, breakfast delicious, the service staff nice, though our stay was not without very disturbing problems. On our first night we returned to our room after dinner, got into bed to find a ripped sheet, blood on the sheets, pillow cases and mattress pad. Margo the concierge on duty was very apologetic and quickly changed the entire bed herself. Upon check out day we requested a late checkout of 1pm. We returned to our room at 1:04pm and found our possessions being removed from the room and our room being stripped. We felt like we were getting the bums rush at $350 a night mind you. Later while checking out with the concierge Jim O'Neill we mentioned that we were not happy with our room being stripped and our possessions moved, he did not care. Further I said please also inform housekeeping that the shower has black mold, Jim's response was "it's very humid here that can't be helped" it was 50 degrees during our visit not to mention the rooms are climate controlled. Also while there I had a very bad fall on the backstairs from the courtyard into the the hotel, leaving a very painful black and blue on my thigh. I suggested that a light should be on the stairs because the first stair is black iron and is hard to see at night. Jim disregarded the conversation and started a conversation with the Federal Express delivery man. All in all we can not endorse this B&B, when you pay $350 a night rate you expect a certain level of service, attention to detail and graciousness. The manager of the Inn never spoke to us to apologize for the ripped and bloody sheets. The concierge Jim unfortunately was unyielding and unwilling to listen to the concerns of the B&B's guests. Concierges and management are the faces of a Inn business and we feel that there is a lot of room for improvement at the John Rutledge House Inn. We chose this hotel because we enjoy staying in historic inns. What a gem! This beautifully restored hotel was once the home of a signer of the constitution. As a matter of fact, several drafts of that document were written here. Historical significance aside, it was a lovely place to stay. It was walking distance from everything ( 1 mile, usually was the farthest). The staff was friendly and the concierge, Jim, got us into restaurants And gave good advice on things happening in town. Breakfast, afternoon tea and evening port or sherry was included. Breakfast could be eaten in-room, in the ballroom, or on the lovely piazza. It was a splurge-but well worth the money. 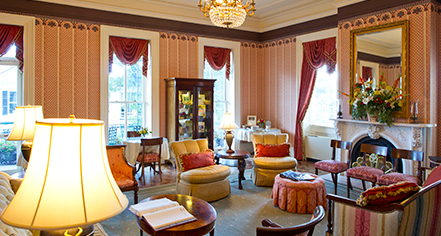 Thank you for this recount of your stay with us at the John Rutledge House Inn. I am glad to hear that you enjoyed our breakfast and central location. Our staff is passionate about hospitality and it is great to read that they were a memorable part of your stay. I will be sure to personally share your words with the team so they can be recognized for the outstanding service they provided you with and I hope to welcome you back to visit us at John Rutledge House Inn. We thoroughly enjoyed everything about theJRHI.The room (#6) was very large, very clean and had both a historical feel as well as every modern touch you would want. The gas fireplace was a great feature too. The Temperpedic mattress felt like home. Our daily walks to all areas of the city was made easy and enjoyable by the properties great location. The breakfast was awesome and we picked several different items during our stay and enjoyed the delivery to our room every morning. What a great touch. Afternoon tea was served everyday with 3 different appetizers to try and they were delicious. Made and delivered fresh daily by one of Charlestons best restaurants. Thank you for the review of John Rutledge House Inn. We are delighted to read that you enjoyed our complimentary breakfast and afternoon tea. We appreciate your very kind words about our staff and your notes about our charming property. We look forward to your return visit. Staying at the John Rutledge House Inn was truly a memorable experience!! The inn is located within walking distances of all that historic Charleston has to offer. The amenities and breakfast were fabulous. The hospitality of everyone we encountered was truly special! Thank you for taking the time to review the John Rutledge House Inn. We are delighted to read that you enjoyed our complimentary breakfast and afternoon tea. We love being able to provide modern amenities, a central location, and accommodations in such a historical setting. We hope you will join us again soon.